Investors enjoyed a sharp recovery in equity prices last week. The major U.S. indexes were higher by 2.7% to nearly 5% for the small cap Russell 2000 Index. The small cap return pulled the index into positive territory for the year: up .8%. This week investors will digest a large number of earnings reports, but the short term focus may be the mid-term election on Tuesday. This week's magazine includes a number of articles that focus on equity market returns around the mid-term election cycle. 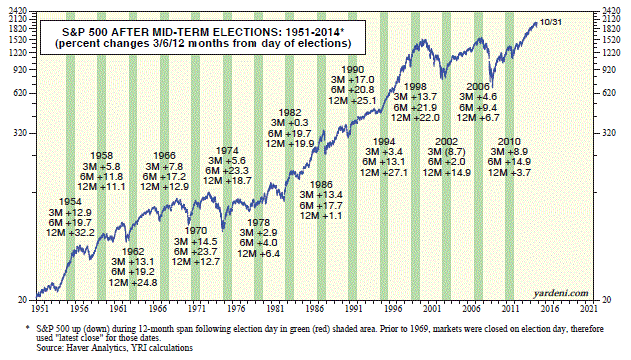 In short, seasonally, the market is entering one of its strongest return periods out of the four year presidential cycle. The chart below is taken from Ed Yardini's blog and it speaks for itself. Lastly, the monthly Mutual Fund Observer is a must read for investors and the November 1st report does not disappoint readers. One section of the report notes the weak cumulative returns investors have realized in the past two market cycles if one includes the bear market returns in the calculation. 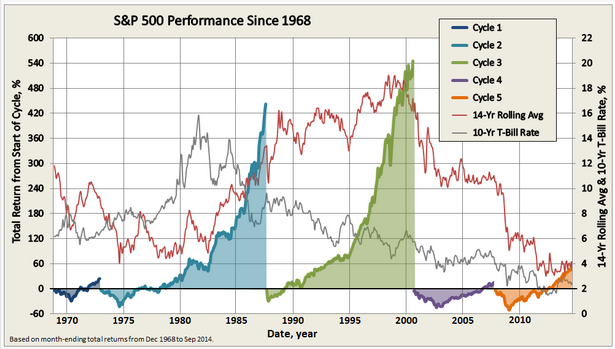 From a positive perspective, the bull markets in the 1980's and 1990's saw significantly better returns than in the past two cycles. Just hoping for a more sustainable bull cycle want will it to be so; however, it does seem we are overdue for a longer and more significant bull run versus what has been experienced in the prior two market cycles.